"Kiarostami" redirects here. For the surname, see Kiarostami (surname). 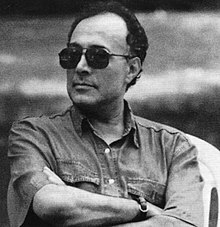 Abbas Kiarostami (Persian: عباس کیارستمی‎ [ʔæbˌbɒːs kijɒːɾostæˈmi] ( listen); 22 June 1940 – 4 July 2016) was an Iranian film director, screenwriter, poet, photographer, and film producer. An active film-maker from 1970, Kiarostami had been involved in the production of over forty films, including shorts and documentaries. Kiarostami attained critical acclaim for directing the Koker trilogy (1987–94), Close-Up (1990), The Wind Will Carry Us (1999), and Taste of Cherry (1997), which was awarded the Palme d'Or at the Cannes Film Festival that year. In later works, Certified Copy (2010) and Like Someone in Love (2012), he filmed for the first time outside Iran: in Italy and Japan, respectively. His films have often ranked among the greatest in the history of cinema. Notably, Close-Up was ranked among the 50 greatest movies of all time in the famous decennial Sight & Sound poll conducted in 2012. Kiarostami had worked extensively as a screenwriter, film editor, art director and producer and had designed credit titles and publicity material. He was also a poet, photographer, painter, illustrator, and graphic designer. He was part of a generation of filmmakers in the Iranian New Wave, a Persian cinema movement that started in the late 1960s and includes pioneering directors such as Bahram Beyzai, Nasser Taghvai, Ali Hatami, Masoud Kimiai, Dariush Mehrjui, Sohrab Shahid-Saless and Parviz Kimiavi. These filmmakers share many common techniques including the use of poetic dialogue and allegorical storytelling dealing with political and philosophical issues. Kiarostami had a reputation for using child protagonists, for documentary-style narrative films, for stories that take place in rural villages, and for conversations that unfold inside cars, using stationary mounted cameras. He is also known for his use of Persian poetry in the dialogue, titles, and themes of his films. Kiarostami's films contain a notable degree of ambiguity, an unusual mixture of simplicity and complexity, and often a mix of fictional and documentary elements. The concepts of change and continuity, in addition to the themes of life and death, play a major role in Kiarostami's works. Kiarostami was born in Tehran. His first artistic experience was painting, which he continued into his late teens, winning a painting competition at the age of 18 shortly before he left home to study at the University of Tehran School of Fine Arts. He majored in painting and graphic design, and supported his studies by working as a traffic policeman. As a painter, designer, and illustrator, Kiarostami worked in advertising in the 1960s, designing posters and creating commercials. Between 1962 and 1966, he shot around 150 advertisements for Iranian television. In the late 1960s, he began creating credit titles for films (including Gheysar by Masoud Kimiai) and illustrating children's books. In 1969, when the Iranian New Wave began with Dariush Mehrjui's film Gāv, Kiarostami helped set up a filmmaking department at the Institute for Intellectual Development of Children and Young Adults (Kanun) in Tehran. Its debut production, and Kiarostami's first film, was the twelve-minute The Bread and Alley (1970), a neo-realistic short film about a schoolboy's confrontation with an aggressive dog. Breaktime followed in 1972. The department became one of Iran's most noted film studios, producing not only Kiarostami's films, but acclaimed Persian films such as The Runner and Bashu, the Little Stranger. Bread and Alley was my first experience in cinema and I must say a very difficult one. I had to work with a very young child, a dog, and an unprofessional crew except for the cinematographer, who was nagging and complaining all the time. Well, the cinematographer, in a sense, was right because I did not follow the conventions of film making that he had become accustomed to. Following The Experience (1973), Kiarostami released The Traveler (Mossafer) in 1974. The Traveler tells the story of Qassem Julayi, a troubled and troublesome boy from a small Iranian city. Intent on attending a football match in far-off Tehran, he scams his friends and neighbors to raise money, and journeys to the stadium in time for the game, only to meet with an ironic twist of fate. In addressing the boy's determination to reach his goal, alongside his indifference to the effects of his amoral actions, the film examined human behavior and the balance of right and wrong. It furthered Kiarostami's reputation for realism, diegetic simplicity, and stylistic complexity, as well as his fascination with physical and spiritual journeys. In 1975, Kiarostami directed two short films So Can I and Two Solutions for One Problem. In early 1976, he released Colors, followed by the fifty-four-minute film A Wedding Suit, a story about three teenagers coming into conflict over a suit for a wedding. Kiarostami's first feature film was the 112-minute Report (1977). It revolved around the life of a tax collector accused of accepting bribes; suicide was among its themes. In 1979, he produced and directed First Case, Second Case. 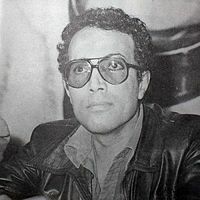 In the early 1980s, Kiarostami directed several short films including Toothache (1980), Orderly or Disorderly (1981), and The Chorus (1982). In 1983, he directed Fellow Citizen. It was not until his release of Where Is the Friend's Home? that he began to gain recognition outside Iran.These films created the basis of his later productions. The film tells a simple account of a conscientious eight-year-old schoolboy's quest to return his friend's notebook in a neighboring village lest his friend be expelled from school. The traditional beliefs of Iranian rural people are portrayed. The film has been noted for its poetic use of the Iranian rural landscape and its realism, both important elements of Kiarostami's work. Kiarostami made the film from a child's point of view. Where Is the Friend's Home?, And Life Goes On (1992) (also known as Life and Nothing More), and Through the Olive Trees (1994) are described by critics as the Koker trilogy, because all three films feature the village of Koker in northern Iran. The films also relate to the 1990 Manjil–Rudbar earthquake, in which 40,000 people died. Kiarostami uses the themes of life, death, change, and continuity to connect the films. The trilogy was successful in France in the 1990s and other Western European countries such as the Netherlands, Sweden, Germany and Finland. But, Kiarostami did not consider the three films to comprise a trilogy. He suggested that the last two titles plus Taste of Cherry (1997) comprise a trilogy, given their common theme of the preciousness of life. In 1987, Kiarostami was involved in the screenwriting of The Key, which he edited but did not direct. In 1989, he released Homework. Kiarostami's first film of the decade was Close-Up (1990), which narrates the story of the real-life trial of a man who impersonated film-maker Mohsen Makhmalbaf, conning a family into believing they would star in his new film. The family suspects theft as the motive for this charade, but the impersonator, Hossein Sabzian, argues that his motives were more complex. The part-documentary, part-staged film examines Sabzian's moral justification for usurping Makhmalbaf's identity, questioning his ability to sense his cultural and artistic flair. Ranked #42 in British Film Institute's The Top 50 Greatest Films of All Time, Close-Up received praise from directors such as Quentin Tarantino, Martin Scorsese, Werner Herzog, Jean-Luc Godard, and Nanni Moretti and was released across Europe. In 1992, Kiarostami directed Life, and Nothing More..., regarded by critics as the second film of the Koker trilogy. The film follows a father and his young son as they drive from Tehran to Koker in search of two young boys who they fear might have perished in the 1990 earthquake. As the father and son travel through the devastated landscape, they meet earthquake survivors forced to carry on with their lives amid disaster. That year Kiarostami won a Prix Roberto Rossellini, the first professional film award of his career, for his direction of the film. The last film of the so-called Koker trilogy was Through the Olive Trees (1994), which expands a peripheral scene from Life and Nothing More into the central drama. Critics such as Adrian Martin have called the style of filmmaking in the Koker trilogy as "diagrammatical", linking the zig-zagging patterns in the landscape and the geometry of forces of life and the world. A flashback of the zigzag path in Life and Nothing More... (1992) in turn triggers the spectator's memory of the previous film, Where Is the Friend's Home? from 1987, shot before the earthquake. This symbolically links to the post-earthquake reconstruction in Through the Olive Trees in 1994. In 1995, Miramax Films released Through the Olive Trees in the US theaters. Kiarostami next wrote the screenplays for The Journey and The White Balloon (1995), for his former assistant Jafar Panahi. Between 1995 and 1996, he was involved in the production of Lumière and Company, a collaboration with 40 other film directors. Kiarostami won the Palme d'Or (Golden Palm) award at the Cannes Film Festival for Taste of Cherry. It is the drama of a man, Mr. Badii, determined to commit suicide. The film involved themes such as morality, the legitimacy of the act of suicide, and the meaning of compassion. Kiarostami directed The Wind Will Carry Us in 1999, which won the Grand Jury Prize (Silver Lion) at the Venice International Film Festival. The film contrasted rural and urban views on the dignity of labor, addressing themes of gender equality and the benefits of progress, by means of a stranger's sojourn in a remote Kurdish village. An unusual feature of the movie is that many of the characters are heard but not seen; at least thirteen to fourteen speaking characters in the film are never seen. In 2000, at the San Francisco Film Festival award ceremony, Kiarostami was awarded the Akira Kurosawa Prize for lifetime achievement in directing, but surprised everyone by giving it away to veteran Iranian actor Behrooz Vossoughi for his contribution to Iranian cinema. In 2001, Kiarostami and his assistant, Seifollah Samadian, traveled to Kampala, Uganda at the request of the United Nations International Fund for Agricultural Development, to film a documentary about programs assisting Ugandan orphans. He stayed for ten days and made ABC Africa. The trip was originally intended as a research in preparation for the filming, but Kiarostami ended up editing the entire film from the video footage shot there. The high number of orphans in Uganda has resulted from the deaths of parents in the AIDS epidemic. Time Out editor and National Film Theatre chief programmer, Geoff Andrew, said in referring to the film: "Like his previous four features, this film is not about death but life-and-death: how they're linked, and what attitude we might adopt with regard to their symbiotic inevitability." The following year, Kiarostami directed Ten, revealing an unusual method of filmmaking and abandoning many scriptwriting conventions. Kiarostami focused on the socio-political landscape of Iran. The images are seen through the eyes of one woman as she drives through the streets of Tehran over a period of several days. Her journey is composed of ten conversations with various passengers, which include her sister, a hitchhiking prostitute, and a jilted bride and her demanding young son. This style of filmmaking was praised by a number of critics. A. O. Scott in The New York Times wrote that Kiarostami, "in addition to being perhaps the most internationally admired Iranian filmmaker of the past decade, is also among the world masters of automotive cinema...He understands the automobile as a place of reflection, observation and, above all, talk." In 2003, Kiarostami directed Five, a poetic feature with no dialogue or characterization. It consists of five long shots of nature which are single-take sequences, shot with a hand-held DV camera, along the shores of the Caspian Sea. Although the film lacks a clear storyline, Geoff Andrew argues that the film is "more than just pretty pictures". He adds, "Assembled in order, they comprise a kind of abstract or emotional narrative arc, which moves evocatively from separation and solitude to community, from motion to rest, near-silence to sound and song, light to darkness and back to light again, ending on a note of rebirth and regeneration. "He notes the degree of artifice concealed behind the apparent simplicity of the imagery. Kiarostami produced 10 on Ten (2004), a journal documentary that shares ten lessons on movie-making while he drives through the locations of his past films. The movie is shot on digital video with a stationary camera mounted inside the car, in a manner reminiscent of Taste of Cherry and Ten. In 2005 and 2006, he directed The Roads of Kiarostami, a 32-minute documentary that reflects on the power of landscape, combining austere black-and-white photographs with poetic observations, engaging music with political subject matter. Also in 2005, Kiarostami contributed the central section to Tickets, a portmanteau film set on a train traveling through Italy. The other segments were directed by Ken Loach and Ermanno Olmi. In 2008, Kiarostami directed the feature Shirin, which features close-ups of many notable Iranian actresses and the French actress Juliette Binoche as they watch a film based on a partly mythological Persian romance tale of Khosrow and Shirin, with themes of female self-sacrifice. The film has been described as "a compelling exploration of the relationship between image, sound and female spectatorship." That summer, he directed Wolfgang Amadeus Mozart's opera Così fan tutte conducted by Christophe Rousset at Festival d'Aix-en-Provence starring with William Shimell. But the following year's performances at the English National Opera was impossible to direct because of refusal of permission to travel abroad from his country. Certified Copy (2010), again starring Juliette Binoche, was made in Tuscany and was Kiarostami's first film to be shot and produced outside Iran. The story of an encounter between a British man and a French woman, it was entered in competition for the Palme d'Or in the 2010 Cannes Film Festival. Peter Bradshaw of The Guardian describes the film as an "intriguing oddity", and said, "Certified Copy is the deconstructed portrait of a marriage, acted with well-intentioned fervour by Juliette Binoche, but persistently baffling, contrived, and often simply bizarre – a highbrow misfire of the most peculiar sort." He concluded that the film is "unmistakably an example of Kiarostami's compositional technique, though not a successful example." Roger Ebert, however, praised the film, noting that "Kiarostami is rather brilliant in the way he creates offscreen spaces." Binoche won the Best Actress Award at Cannes for her performance in the film. Kiarostami's pentultimate film, Like Someone in Love, set and shot in Japan, received largely positive reviews from critics. Kiarostami was a jury member at numerous film festivals, most notably the Cannes Film Festival in 1993, 2002 and 2005. He was also the president of the Caméra d'Or Jury in Cannes Film Festival 2005. He was announced as the president of the Cinéfondation and short film sections of the 2014 Cannes Film Festival. Other representatives include the Venice Film Festival in 1985, the Locarno International Film Festival in 1990, the San Sebastian International Film Festival in 1996, the São Paulo International Film Festival in 2004, the Capalbio Cinema Festival in 2007 (in which he was president of the jury), and the Küstendorf Film and Music Festival in 2011. He also made regular appearances at many other film festivals across Europe, including the Estoril Film Festival in Portugal. Though Kiarostami has been compared to Satyajit Ray, Vittorio de Sica, Éric Rohmer, and Jacques Tati, his films exhibit a singular style, often employing techniques of his own invention. During the filming of The Bread and Alley in 1970, Kiarostami had major differences with his experienced cinematographer about how to film the boy and the attacking dog. While the cinematographer wanted separate shots of the boy approaching, a close-up of his hand as he enters the house and closes the door, followed by a shot of the dog, Kiarostami believed that if the three scenes could be captured as a whole it would have a more profound impact in creating tension over the situation. That one shot took around forty days to complete, until Kiarostami was fully content with the scene. Kiarostami later commented that the breaking of scenes would have disrupted the rhythm and content of the film's structure, preferring to let the scene flow as one. Unlike other directors, Kiarostami showed no interest in staging extravagant combat scenes or complicated chase scenes in large-scale productions, instead attempting to mold the medium of film to his own specifications. Kiarostami appeared to have settled on his style with the Koker trilogy, which included a myriad of references to his own film material, connecting common themes and subject matter between each of the films. Stephen Bransford has contended that Kiarostami's films do not contain references to the work of other directors, but are fashioned in such a manner that they are self-referenced. Bransford believes his films are often fashioned into an ongoing dialectic with one film reflecting on and partially demystifying an earlier film. He continued experimenting with new modes of filming, using different directorial methods and techniques. A case in point is Ten, which was filmed in a moving automobile in which Kiarostami was not present. He gave suggestions to the actors about what to do, and a camera placed on the dashboard filmed them while they drove around Tehran. The camera was allowed to roll, capturing the faces of the people involved during their daily routine, using a series of extreme-close shots. Ten was an experiment that used digital cameras to virtually eliminate the director. This new direction towards a digital micro-cinema is defined as a micro-budget filmmaking practice, allied with a digital production basis. Kiarostami's cinema offers a different definition of film. According to film professors such as Jamsheed Akrami of William Paterson University, Kiarostami consistently tried to redefine film by forcing the increased involvement of the audience. In his later years, he also progressively trimmed the timespan within his films. Akrami thinks that this reduces the filmmaking from a collective endeavor to a purer, more basic form of artistic expression. Kiarostami's films contain a notable degree of ambiguity, an unusual mixture of simplicity and complexity, and often a mix of fictional and documentary elements (docufiction). Kiarostami has stated, "We can never get close to the truth except through lying." [I]t all looks like reporting, but everything underscores (indique à l'évidence) that it is the fiction of a documentary (in fact, Kiarostami shot the film several months after the earthquake), and that it is rather a document about "fiction": not in the sense of imagining the unreal, but in the very specific and precise sense of the technique, of the art of constructing images. For the image by means of which, each time, each opens a world and precedes himself in it (s'y précède) is not pregiven (donnée toute faite) (as are those of dreams, phantasms or bad films): it is to be invented, cut and edited. Thus it is evidence, insofar as, if one day I happen to look at my street on which I walk up and down ten times a day, I construct for an instant a new evidence of my street. Existence resists the indifference of life-and-death, it lives beyond mechanical "life," it is always its own mourning, and its own joy. It becomes figure, image. It does not become alienated in images, but it is presented there: the images are the evidence of its existence, the objectivity of its assertion. This thought—which, for me, is the very thought of this film [Life and Nothing More...]—is a difficult thought, perhaps the most difficult. It's a slow thought, always under way, fraying a path so that the path itself becomes thought. It is that which frays images so that images become this thought, so that they become the evidence of this thought—and not in order to "represent" it. In other words, wanting to accomplish more than just represent life and death as opposing forces, but rather to illustrate the way in which each element of nature is inextricably linked, Kiarostami devised a cinema that does more than just present the viewer with the documentable "facts," but neither is it simply a matter of artifice. Because "existence" means more than simply life, it is projective, containing an irreducibly fictive element, but in this "being more than" life, it is therefore contaminated by mortality. Nancy is giving a clue, in other words, toward the interpretation of Kiarostami's statement that lying is the only way to truth. The concepts of change and continuity, in addition to the themes of life and death, play a major role in Kiarostami's works. In the Koker trilogy, these themes play a central role. As illustrated in the aftermath of the 1990 Tehran earthquake disaster, they also represent the power of human resilience to overcome and defy destruction. Unlike the Koker films, which convey an instinctual thirst for survival, Taste of Cherry explores the fragility of life and focuses on how precious it is. Symbols of death abound in The Wind Will Carry Us, with the scenery of the graveyard, the imminence of the old woman's passing, and the ancestors referred to early in the film by the character Farzad. Such devices prompt the viewer to reflect on the parameters of the afterlife and immaterial existence. The viewer is asked to consider what constitutes the soul, and what happens to it after death. In discussing the film, Kiarostami said that he is the person who raises questions, rather than answers them. Some film critics believe that the assemblage of light versus dark scenes in Kiarostami's film grammar, such as in Taste of Cherry and The Wind Will Carry Us, suggests the mutual existence of life with its endless possibilities, and death as a factual moment of anyone's life. Kiarostami's style is notable for the use of panoramic long shots, such as in the closing sequences of Life and Nothing More and Through the Olive Trees, where the audience is intentionally distanced physically from the characters in order to stimulate reflection on their fate. Taste of Cherry is punctuated throughout by shots of this kind, including distant overhead shots of the suicidal Badii's car moving across the hills, usually while he is conversing with a passenger. However, the visual distancing techniques stand in juxtaposition to the sound of the dialog, which always remains in the foreground. Like the coexistence of a private and public space, or the frequent framing of landscapes through car windows, this fusion of distance with proximity can be seen as a way of generating suspense in the most mundane of moments. This relationship between distance and intimacy, between imagery and sound, is also present in the opening sequence to The Wind Will Carry Us. Michael J. Anderson has argued that such a thematic application of this central concept of presence without presence, through using such techniques, and by often referring to characters which the viewer does not see and sometimes not hear directly affects the nature and concept of space in the geographical framework in which the world is portrayed. Kiarostami's use of sound and imagery conveys a world beyond what is directly visible and/or audible, which Anderson believes emphasizes the interconnectedness and shrinking of time and space in the modern world of telecommunications. Other commentators such as film critic Ben Zipper believe that Kiarostami's work as a landscape artist is evident in his compositional distant shots of the dry hills throughout a number of his films directly impacting on his construction on the rural landscapes within his films. However, the aesthetic element involved with the poetry goes much farther back in time and is used more subtly than these examples suggest. Beyond issues of adaptation of text to film, Kiarostami often begins with an insistent will to give visual embodiment to certain specific image-making techniques in Persian poetry, both classical and modern. This prominently results in enunciating a larger philosophical position, namely the ontological oneness of poetry and film. It has been argued that the creative merit of Kiarostami's adaptation of Sohrab Sepehri and Forough Farrokhzad's poems extends the domain of textual transformation. Adaptation is defined as the transformation of a prior to a new text. Sima Daad of the University of Washington contends that Kiarostami's adaptation arrives at the theoretical realm of adaptation by expanding its limit from inter-textual potential to trans-generic potential. Kiarostami's films often reflect upon immaterial concepts such as soul and afterlife. At times, however, the very concept of the spiritual seems to be contradicted by the medium. Some film theorists have argued that The Wind Will Carry Us provides a template by which a filmmaker can communicate metaphysical reality. The limits of the frame, the material representation of a space in dialog with another that is not represented, physically become metaphors for the relationship between this world and those which may exist apart from it. By limiting the space of the mise en scène, Kiarostami expands the space of the art. Kiarostami's "complex" sound-images and philosophical approach have caused frequent comparisons with "mystical" filmmakers such as Andrei Tarkovsky and Robert Bresson. While acknowledging substantial cultural differences, much of Western critical writing about Kiarostami positions him as the Iranian equivalent of such directors, by virtue of a similarly austere, "spiritual" poetics and moral commitment. Some draw parallels between certain imagery in Kiarostami's films with that of Sufi concepts. While most English-language writers, such as David Sterritt and the Spanish film professor Alberto Elena, interpret Kiarostami's films as spiritual, other critics, including David Walsh and Hamish Ford, have not rated its influence in his films as lower. Kiarostami, along with Jean Cocteau, Satyajit Ray, Derek Jarman and Alejandro Jodorowsky, was a filmmaker who expressed himself in other genres, such as poetry, set designs, painting, or photography. They expressed their interpretation of the world and their understanding of our preoccupations and identities. Kiarostami was a noted photographer and poet. A bilingual collection of more than 200 of his poems, Walking with the Wind, was published by Harvard University Press. His photographic work includes Untitled Photographs, a collection of over thirty photographs, mostly of snow landscapes, taken in his hometown Tehran, between 1978 and 2003. In 1999, he also published a collection of his poems. Kiarostami also produced Mozart's opera, Così fan tutte, which premiered in Aix-en-Provence in 2003 before being performed at the English National Opera in London in 2004. Riccardo Zipoli, from the Ca' Foscari University of Venice, has studied the relations and interconnections between Kiarostami's poems and his films. The results of the analysis reveal how Kiarostami's treatment of "uncertain reality" is similar in his poems and films. Kiarostami's poetry is reminiscent of the later nature poems of the Persian painter-poet, Sohrab Sepehri. On the other hand, the succinct allusion to philosophical truths without the need for deliberation, the non-judgmental tone of the poetic voice, and the structure of the poem—absence of personal pronouns, adverbs or over reliance on adjectives—as well as the lines containing a kigo (きご季語, a "season word") gives much of this poetry a haikuesque characteristic. Kiarostami's three volumes of original verse, plus his selections from classical and contemporary Persian poets, including Nima, Hafez, Rumi and Saadi, were translated into English in 2015 and were published in bilingual (Persian/English) editions by Sticking Place Books in New York. In 1969, Kiarostami married Parvin Amir-Gholi. They had two sons, Ahmad (born 1971) and Bahman (1978). They divorced in 1982. When you take a tree that is rooted in the ground, and transfer it from one place to another, the tree will no longer bear fruit. And if it does, the fruit will not be as good as it was in its original place. This is a rule of nature. I think if I had left my country, I would be the same as the tree. Kiarostami frequently wore dark spectacles or sunglasses, which he required because of a sensitivity to light. In March 2016, Kiarostami was hospitalized due to intestinal bleeding and reportedly went into a coma after undergoing two operations. Sources, including a Ministry of Health and Medical Education spokesman, reported that Kiarostami was suffering from gastrointestinal cancer. On 3 April 2016, Reza Paydar, the director of Kiarostami's medical team, made a statement denying that the filmmaker had cancer. However, in late June he left Iran for treatment in a Paris hospital, where he died on 4 July 2016. The week before his death, Kiarostami had been invited to join the Academy Awards in Hollywood as part of efforts to increase the diversity of its Oscar judges. Ali Ahani, Iran's ambassador to France stated that Kiarostami's body would be transferred to Iran to be buried at Behesht-e Zahra cemetery. However, it was later announced that his body would be buried in Lavasan, a resort town about 40 km (25 mi) northeast of Tehran, based on his own will, after it is flown back to Tehran from Paris. His body was returned to Tehran's Imam Khomeini International Airport on 8 July 2016, while a crowd of Iranian film directors, actors, actresses and other artists were in Tehran airport to pay their respects. Mohammad Shirvani, a fellow filmmaker and close friend, quoted Kiarostami on his Facebook wall June 8, 2016: "I do not believe I could stand and direct any more films. They [the medical team] destroyed it [his digestive system]." After this comment, a campaign was set up by Iranians on both Twitter and Facebook to investigate the possibility of medical error during Kiarostami's procedure. However, Ahmad Kiarostami, his eldest son, denied any medical error in his father's treatment after Shirvani's comment and said that his father's health was no cause for alarm. After Kiarostami's death, Head of the Iranian Medical Council Dr. Alireza Zali sent a letter to his French counterpart, Patrick Bouet, urging him to send Kiarostami's medical file to Iran for further investigation. Nine days after Kiarostami's death, on July 13, 2016, his family issued a formal complaint of medical maltreatment through Kiarostami's personal doctor. Dariush Mehrjui, famous Iranian cinema director also criticized the medical team that treated Kiarostami and demanded legal action. Martin Scorsese said he was "deeply shocked and saddened" by the news. Oscar-winning Iranian film-maker Asghar Farhadi – who had been due to fly to Paris to visit his friend – said he was "very sad, in total shock". Mohsen Makhmalbaf echoed the sentiment, saying Iran's cinema owes its global reputation to his fellow director, but that this visibility did not translate into a greater visibility for his work in his homeland. "Kiarostami gave the Iranian cinema the international credibility that it has today," he told The Guardian. "But his films were unfortunately not seen as much in Iran. He changed the world's cinema; he freshened it and humanised it in contrast with Hollywood's rough version." Persian mystic and poet Jalal al-Din Rumi's 22nd niece Esin Celebi also expressed her condolences over the demise of Kiarostami in a separate message. Iran's representative office at the United Nations Educational, Scientific and Cultural Organization, UNESCO also opened a memorial book for signature to honour Kiatostami. Iranian President Hassan Rouhani said on Twitter that the director's "different and profound attitude towards life and his invitation to peace and friendship" would be a "lasting achievement." Foreign Minister Mohammad-Javad Zarif also said Kiarostami's death was a loss for international cinema. In a statement, French President François Hollande praised the director for forging "close artistic ties and deep friendships" with France. Media, such as The New York Times, CNN, The Guardian, The Huffington Post, The Independent, Associated Press, Euronews and Le Monde also reacted to Kiarostami's death. The New York Times wrote: "Abbas Kiarostami, Acclaimed Iranian Filmmaker, Dies at 76" and Peter Bradshaw paid tribute to Kiarostami: "a sophisticated, self-possessed master of cinematic poetry"
Artists, cultural authorities, government officials and the Iranian people gathered to say goodbye to Kiarostami on 10 July, in an emotional funeral, six days after his death in France. The ceremony was held at the Center for the Intellectual Education of Children, where he began his film-making career some 40 years ago. Attendees held banners with the titles of his movies and pictures of his most famous posters, as they praised the support Kiarostami contributed to culture, and particularly, to filmmaking in Iran. The ceremony was hosted by famous Iranian actor Parviz Parastooie, and included speeches by painter Aidin Aghdashlou and by also prize-winning film director Asghar Farhadi, who stressed his professional abilities. He was later buried in a private ceremony in northern Tehran town, Lavasan. 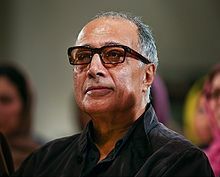 Kiarostami has received worldwide acclaim for his work from both audiences and critics, and, in 1999, he was voted the most important film director of the 1990s by two international critics' polls. Four of his films were placed in the top six of Cinematheque Ontario's Best of the '90s poll. He has gained recognition from film theorists, critics, as well as peers such as Jean-Luc Godard, Nanni Moretti (who made a short film about opening one of Kiarostami's films in his theater in Rome), Chris Marker, and Ray Carney. Akira Kurosawa said of Kiarostami's films: "Words cannot describe my feelings about them ... When Satyajit Ray passed on, I was very depressed. But after seeing Kiarostami's films, I thanked God for giving us just the right person to take his place." Critically acclaimed directors such as Martin Scorsese have commented that "Kiarostami represents the highest level of artistry in the cinema." The Austrian director Michael Haneke has admired the work of Abbas Kiarostami as among the best of any living director. In 2006, The Guardian's panel of critics ranked Kiarostami as the best contemporary non-American film director. Critics such as Jonathan Rosenbaum have argued that "there's no getting around the fact that the movies of Abbas Kiarostami divide audiences—in this country, in his native Iran, and everywhere else they're shown." Rosenbaum argues that disagreements and controversy over Kiarostami's movies have arisen from his style of film-making because what in Hollywood would count as essential narrative information is frequently missing from Kiarostami's films. Camera placement, likewise, often defies standard audience expectations: in the closing sequences of Life and Nothing More and Through the Olive Trees, the audience is forced to imagine the dialogue and circumstances of important scenes. In Homework and Close-Up, parts of the soundtrack are masked or silenced. Critics have argued that the subtlety of Kiarostami's cinematic expression is largely resistant to critical analysis. While Kiarostami has won significant acclaim in Europe for several of his films, the Iranian government has refused to permit the screening of his films, to which he responded "The government has decided not to show any of my films for the past 10 years... I think they don't understand my films and so prevent them being shown just in case there is a message they don't want to get out". In the wake of the September 11 attacks, Kiarostami was refused a visa to attend the New York Film Festival. The festival director, Richard Peña, who had invited him said, "It's a terrible sign of what's happening in my country today that no one seems to realize or care about the kind of negative signal this sends out to the entire Muslim world". The Finnish film director Aki Kaurismäki boycotted the festival in protest. Kiarostami had been invited by the New York Film Festival, as well as Ohio University and Harvard University. In 2005, London Film School organized a workshop as well as festival of Kiarostami's work, titled "Abbas Kiarostami: Visions of the Artist". Ben Gibson, Director of the London Film School, said, "Very few people have the creative and intellectual clarity to invent cinema from its most basic elements, from the ground up. We are very lucky to have the chance to see a master like Kiarostami thinking on his feet." He was later made Honorary Associate. In 2007, the Museum of Modern Art and MoMA PS1 coorganized a festival of the Kiarostami's work titled Abbas Kiarostami: Image Maker. Kiarostami and his cinematic style have been the subject of several books and three films, Opening Day of Close-Up (1996), directed by Nanni Moretti, Abbas Kiarostami: The Art of Living (2003), directed by Fergus Daly, and Abbas Kiarostami: A Report (2014), directed by Bahman Maghsoudlou. Kiarostami was a member of the advisory board of World Cinema Foundation. Founded by the director Martin Scorsese, its goal is to find and reconstruct world cinema films that have been long neglected. Havres : French translation by Tayebeh Hashemi and Jean-Restom Nasser, ÉRÈS (PO&PSY); Bilingual edition (3 June 2010) ISBN 978-2-7492-1223-4. Abbas Kiarostami: Cahiers du Cinema Livres (24 October 1997) ISBN 2-86642-196-5. Walking with the Wind (Voices and Visions in Film): English translation by Ahmad Karimi-Hakkak and Michael C. Beard, Harvard Film Archive; Bilingual edition (28 February 2002) ISBN 0-674-00844-8. 10 (ten): Cahiers du Cinema Livres (5 September 2002) ISBN 2-86642-346-1. With Nahal Tajadod and Jean-Claude Carrière Avec le vent: P.O.L. (5 May 2002) ISBN 2-86744-889-1. Le vent nous emportera: Cahiers du Cinema Livres (5 September 2002) ISBN 2-86642-347-X. La Lettre du Cinema: P.O.L. (12 December 1997) ISBN 2-86744-589-2. Mohammed Afkhami, Sussan Babaie, Venetia Porter, Natasha Morris. "Honar: The Afkhami Collection of Modern and Contemporary Iranian Art." Phaidon Press, 2017. ISBN 978-0-7148-7352-7. ^ Panel of critics (14 November 2003). "The world's 40 best directors". London: Guardian Unlimited. Retrieved 23 February 2007. ^ Karen Simonian (2002). "Abbas Kiarostami Films Featured at Wexner Center" (PDF). Wexner center for the art. Archived from the original (PDF) on 10 July 2007. Retrieved 23 February 2007. ^ "2002 Ranking for Film Directors". British Film Institute. 2002. Retrieved 23 February 2007. ^ "The 100 greatest foreign-language films". ^ "Critics' top 100 | BFI". ^ "Directors' top 100 | BFI". ^ "Abbas Kiarostami Biography". Firouzan Film. 2004. Retrieved 23 February 2007. ^ a b c d e f g h "Abbas Kiarostami: Biography". Zeitgeist, the spirit of the time. Archived from the original on 18 February 2007. Retrieved 23 February 2007. ^ Ed Hayes (2002). "10 x Ten: Kiarostami's journey". Open Democracy. Archived from the original on 9 January 2007. Retrieved 23 February 2007. ^ Hamid Dabashi (2002). "Notes on Close Up – Iranian Cinema: Past, Present and Future". Strictly Film School. Archived from the original on 17 February 2007. Retrieved 23 February 2007. ^ a b c Shahin Parhami (2004). "A Talk with the Artist: Abbas Kiarostami in Conversation". Synoptique. Retrieved 23 February 2007. ^ David Parkinson (2005). "Abbas Kiarostami Season". BBC. Retrieved 23 February 2007. ^ Chris Payne. "Abbas Kiarostami Masterclass". Channel4. Archived from the original on 8 March 2007. Retrieved 23 February 2007. ^ "Films by Abbas Kiarostami". Stanford University. 1999. ^ Rebecca Flint. "Where Is the friend's home?". World records. Retrieved 27 February 2007. ^ Chris Darke. "Where Is the Friend's Home?" (PDF). Zeitgeistfilms. Archived from the original (PDF) on 27 January 2007. Retrieved 27 February 2007. ^ a b David Parkinson (2005). "Abbas Kiarostami Season: National Film Theatre, 1st-31 May 2005". BBC. Retrieved 23 February 2007. ^ a b c Godfrey Cheshire. "Taste of Cherry". The Criterion Collection. Retrieved 23 February 2007. ^ Ed Gonzalez (2002). "Close Up". Slant Magazine. Archived from the original on 12 June 2007. ^ Jeffrey M. Anderson (2000). "Close-Up: Holding a Mirror up to the Movies". Combustible Celluloid. Retrieved 22 February 2007. ^ "Close-Up". Bfi Video Publishing. 1998. ^ Hemangini Gupta (2005). "Celebrating film-making". The Hindu. ^ Jeremy Heilman (2002). "Life and Nothing More… (Abbas Kiarostami) 1991". MovieMartyr. ^ a b c Jonathan Rosenbaum (1997). "Fill In The Blanks". Chicago Reader. ^ Film Info. "And Life Goes On (synopsis)". Zeitgeistfilms. Archived from the original on 16 February 2007. ^ a b Stephen Bransford (2003). "Days in the Country: Representations of Rural Space ..." Sense of Cinema. ^ Maximilian Le Cain. "Kiarostami: The Art of Living". Film Ireland. Archived from the original on 10 December 2009. ^ "Where is the director?". British Film Institute. 2005. Archived from the original on 2 February 2006. ^ "Festival de Cannes: Taste of Cherry". festival-cannes.com. Archived from the original on 22 August 2011. Retrieved 23 September 2009. ^ Constantine Santas (2000). "Concepts of Suicide in Kiarostami's Taste of Cherry". Sense of Cinema. ^ a b Geoff Andrew (25 May 2005). "Abbas Kiarostami, interview". London: Guardian Unlimited. Archived from the original on 14 March 2010. Retrieved 12 April 2010. ^ Judy Stone. "Not Quite a Memoire". Firouzan Films. Retrieved 23 February 2007. ^ Jeff Lambert (2000). "43rd Annual San Francisco International Film Festival". Sense of Cinema. ^ Geoff Andrew, Ten (London: BFI Publishing, 2005), p. 35. ^ Geoff Andrew, Ten, (London: BFI Publishing, 2005) p. 32. ^ Ten info. "Ten (film) synopsis". Zeitgeistfilms. Archived from the original on 16 February 2007. Retrieved 23 February 2007. ^ Geoff Andrew, Ten, (London: BFI Publishing, 2005) pp 73–4. ^ a b c d Ginsberg, Terri; Lippard, Chris (2010). Historical Dictionary of Middle Eastern Cinema. Scarecrow Press. p. 236. ISBN 978-0-8108-6090-2. Archived from the original on 20 July 2013. Retrieved 3 March 2012. ^ Pulver, Andrew (29 August 2008). "Film Review: Shirin". The Guardian. Retrieved 17 February 2012. ^ "Iranian film "Shirin" a rewarding challenge". Hollywood Reporter via Reuters. 29 August 2008. Retrieved 17 July 2012. ^ Higgins, Charlotte (2009-05-05). "No Così relationship: visa row scuppers ENO's bid to secure Abbas Kiarostami". The Guardian. Retrieved 6 July 2016. ^ a b Bradshaw, Peter (2 September 2010). "Certified Copy Review". The Guardian. Retrieved 17 February 2012. ^ Ebert, Roger (6 December 2011). Roger Ebert's Movie Yearbook 2012. Andrews McMeel Publishing. p. 93. ISBN 978-1-4494-2150-2. ^ "Abbas Kiarostami to preside over jury at Cannes film festival". PressTV. Archived from the original on 14 March 2014. Retrieved 13 March 2014. ^ "Abbas Kiarostami". IndiePix. 2004. Archived from the original on 22 October 2007. Retrieved 23 February 2007. ^ "Abbas Kiarostami". Cannes Film Festival. Archived from the original on 5 December 2013. Retrieved 23 February 2007. ^ Nick Vivarelli (11 June 2007). "Kiarostami to head Capalbio jury". Variety.com. Retrieved 16 June 2007. ^ a b Jamsheed Akrami (2005). "Cooling Down a 'Hot Medium'". Iran Heritage Foundation. Archived from the original on 27 September 2007. Retrieved 23 February 2007. ^ Ben Sachs (2003). "With liberty for all: the films of Kiarostami". The Mac Weekly. Archived from the original on 22 September 2006. Retrieved 27 February 2007. ^ Adrian Martin (2001). "The White Balloon and Iranian Cinema". Sense of Cinema. Archived from the original on 27 January 2007. Retrieved 23 February 2007. ^ Charles Mudede (1999). "Kiarostami's Genius Style". The Stranger. Retrieved 23 February 2007. ^ Jean-Luc Nancy, "On Evidence: Life and Nothing More, by Abbas Kiarostami," Discourse 21.1 (1999), p.82. Also, cf., Jean Luc Nancy. Is Cinema Renewing Itself? Film-Philosophy. vol. 6 no. 15, July 2002. ^ Jean-Luc Nancy, "On Evidence: Life and Nothing More, by Abbas Kiarostami," Discourse 21.1 (1999), p.85–6. ^ Injy El-Kashef and Mohamed El-Assyouti (2001). "Strategic lies". Al-Ahram Weekly. Archived from the original on 17 February 2007. Retrieved 23 February 2007. ^ a b c Michael J. Anderson (2004). "Beyond Borders". reverse shot. Retrieved 23 February 2007. ^ a b c Khatereh Sheibani (2006). "Kiarostami and the Aesthetics of Modern Persian Poetry". Iranian Studies. 39 (4): 509–537. doi:10.1080/00210860601005088. ^ Sima Daad (2005). "Adaption, Fidelity, and Transformation: Kiarostami and the Modernist Poetry of Iran". Iran Heritage Foundation. Archived from the original on 27 September 2007. Retrieved 23 February 2007. ^ a b Hamish Ford (2005). "The Cinema of Abbas Kiarostami by Alberto Elena". Sense of Cinema. Retrieved 23 February 2007. ^ a b Nacim Pak (2005). "Religion and Spirituality in Kiarostami's Works". Iran Heritage Foundation. Archived from the original on 27 September 2007. Retrieved 23 February 2007. ^ a b Narguess Farzad (2005). "Simplicity and Bliss: Poems of Abbas Kiarostami". Iran Heritage Foundation. Archived from the original on 27 September 2007. Retrieved 23 February 2007. ^ Kiarostami mostra fotos de neve (Kiarostami shows snow photographs) (Portuguese) – a newspaper article on the display of Untitled Photographs in Lisbon. ^ Riccardo Zipoli (2005). "Uncertain Reality: A Topos in Kiarostami's Poems and Films". Iran Heritage Foundation. Archived from the original on 27 September 2007. Retrieved 23 February 2007. ^ Jeffries, Stuart (29 November 2005). "Landscapes of the mind". London: Guardian Unlimited. Retrieved 28 February 2007. ^ Ari Siletz (2006). "Besides censorship". Iranian.com. Retrieved 27 February 2007. ^ a b Leading Iranian filmmaker Abbas Kiarostami battles coma, cancer. Payvand. ^ a b "Medical team director denies report on Abbas Kiarostami's cancer. Archived 8 April 2016 at the Wayback Machine Tehran Times. ^ a b Pulver, Andrew; Dehghan, Saeed Kamali (4 July 2016). "Abbas Kiarostami, Palme d'Or-winning Iranian film-maker, dies aged 76". The Guardian. ^ "Tributes flow for Iranian filmmaker Abbas Kiarostami, giant of world cinema". scmp.com. 2016-07-06. ^ "سفیر ایران در فرانسه: پیگیر ترخیص و انتقال پیکر کیارستمی به ایران هستیم". ^ آخرین اخبار ایران و جهان. "پیکر کیارستمی در لواسان به خاک سپرده می‌شود". خبرگزاری باشگاه خبرنگاران - آخرین اخبار ایران و جهان - YJC. ^ "Abbas Kiarostami's body arrives in Tehran among mourning crowds of artists". www.payvand.com. ^ "Abbas Kiarostami: Martin Scorsese pays tribute to 'one of our great artists'". 2016-07-05. ^ "Artists, officials mourn loss of auteur Abbas Kiarostam". 8 July 2016. ^ Grimes, William (2016-07-04). "Abbas Kiarostami, Acclaimed Iranian Filmmaker, Dies at 76". The New York Times. ^ Bradshaw, Peter (4 July 2016). "Abbas Kiarostami: a highly sophisticated, self-possessed master of cinematic poetry - Peter Bradshaw". the Guardian. ^ "Iran bids farewell to film director Abbas Kiarostami, darling of world cinema". 2016-07-11. ^ "Mourning crowds bid farewell to Abbas Kiarostami". 10 July 2016. ^ "Iran: thousands mourn film director Abbas Kiarostami". 10 July 2016. ^ Dorna Khazeni (2002). "Close Up: Iranian Cinema Past Present and Future, by Hamid Dabashi". Brightlightsfilms. Archived from the original on 13 July 2009. Retrieved 23 February 2007. ^ Jason Anderson (2002). "Carried by the wind: Films by Abbas Kiarostami". Eye Weekly. Archived from the original on 27 October 2014. Retrieved 23 February 2007. ^ Cynthia Rockwell (2001). "Carney on Cassavetes: Film critic Ray Carney sheds light on the work of legendary indie filmmaker, John Cassavetes". NEFilm. Retrieved 23 February 2007. ^ a b c Stuart Jeffries (2005). "Abbas Kiarostami – Not A Martyr". The Guardian. Archived from the original on 8 February 2007. Retrieved 23 February 2007. ^ Wray, John (23 September 2007). "Minister of Fear". New York Times. Retrieved 24 October 2008. ^ Panel of critics (2006). "The world's 40 best directors". London: The Guardian. Archived from the original on 27 February 2007. Retrieved 23 February 2007. ^ Daniel Ross, Review of Geoff Andrew, Ten. ^ Andrew O'Hehir (2002). "Iran's leading filmmaker denied U.S. visa". Salon.com. Archived from the original on 17 February 2007. Retrieved 23 February 2007. ^ "Iranian director hands back award". BBC. 17 October 2002. Retrieved 23 February 2007. ^ Celestine Bohlen (2002). "Abbas Kiarostami Controversy at the 40th NYFF". Human Rights Watch. Archived from the original on 14 February 2007. Retrieved 23 February 2007. ^ Jacques Mandelbaum (2002). "No entry for Kiarostami". Le Monde. Retrieved 23 February 2007. ^ "Abbas Kiarostami workshop 2–10 May 2005". Pars times. 2005. Retrieved 23 February 2007. ^ "Abbas Kiarostami: Image Maker". Museum of Modern Art. 2007. Archived from the original on 3 May 2007. Retrieved 28 February 2007. ^ "Martin Scorsese goes global". US today. 22 May 2007. Archived from the original on 23 May 2011. Retrieved 29 May 2007. ^ "Kiarostami joins Scorsese project". PRESS TV. 2007. Archived from the original on 20 August 2016. Retrieved 29 May 2007. ^ Mehrnaz Saeed-Vafa (2002). "Abbas Kiarostami". Sense of Cinema. Archived from the original on 17 February 2007. Retrieved 27 February 2007. Wikimedia Commons has media related to Abbas Kiarostami.